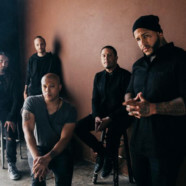 Bad Wolves have officially achieved platinum status for their intergenerational, global smash debut single, “Zombie.” The RIAA certification marks a major milestone for the band, making them the sole rock band to obtain a platinum certification for a 2018 release. The plaque was presented to Bad Wolves by their co-manager, Zoltan Bathory, Eleven Seven Label Group CEO Allen Kovac, and promoters Larry and Fred Frank of Frank Productions/Live Nation prior to their set at the BB&T Pavilion in Camden, NJ. “Zombie is a timeless song that has now had global success twice. From a tragedy, a wonderful outcome. Thank you, Dolores O’Riordan.” says Eleven Seven Label Group CEO Allen Kovac, who managed The Cranberries during the original release of “Zombie”. Bad Wolves released “Zombie” earlier this year as a tribute to the late The Cranberries frontwoman Dolores O’Riordan, who was set to record and reprise her iconic vocals on the track the day she tragically passed away. On June 19th, the band presented her kids with a $250,000 check, donating their proceeds from the massively successful and incredibly resonant track. “Zombie” is not only a definitive moment for Bad Wolves — but it has also proven to be the breakout rock song (and story) of 2018.” The single has also previously reached platinum status in Canada and gold in Australia. To date, “Zombie’s official music video for the song has racked up over 165 million views via Facebook and YouTube. The track hit #1 on Spotify’s viral chart in over 40 countries countries, went to #1 on the iTunes overall songs chart and iTunes rock and metal charts, and reigned atop the US Rock radio chart for three straight weeks. The unprecedented success of “Zombie” lead to Bad Wolves’ debut album Disobey achieving the #22 spot on the Billboard Top 200, #2 on the Hard Rock Chart, #4 on Rock, and #8 on the Top Current Albums Chart. Bad Wolves are currently on the road with Five Finger Death Punch, Breaking Benjamin, and Nothing More as part of the biggest U.S. summer amphitheater rock tour of 2018. The band will continue to tour extensively throughout the end of the year, including a trek across Europe with Three Days Grace this Fall, joining Five Finger Death Punch, Breaking Benjamin and From Ashes to New on their U.S. Fall arena tour, and an arena tour through Canada this winter with Three Days Grace and Nothing More. For tickets, VIP packages and more information, visit here.